Numerous archaeological findings testify to a settlement already occurred in prehistoric times. In Roman times, two municipalities were built in the Fabriano area, Tuficum near Albacina and Attidium (today’s town of Attiggio). The name of the city seems to derive from the adjective Faberianus referable to the Roman noble Faberius. The barbarian invasions and the Greek-Gothic war pushed the inhabitants of the two Roman centers and also of the nearby Sentinum to take refuge on the hill of Castelvecchio, the first nucleus of the future city that would be formed in the twelfth century through the union with Castelnuovo or Poggio. Even before the year 1000, and especially in the eleventh and twelfth centuries, hermitages, monasteries and abbeys arose on the territory of Fabriano, such as the Benedictine S. Maria d’Appennino (mid-10th century, today in a state of neglect) and S. Salvatore in Val di Castro, built between 1005 and 1009 by S. Romualdo, who died there in 1027. Strongly remodeled compared to the original design, the current construction dates back to 1262. The figure of S. Romualdo seems also linked to the foundation, occurred around the year 1000, of the famous hermitage of Fonte Avellana, not far from Fabriano. The Municipality of Fabriano was founded before 1165 by a group of noblemen joined to some artisan guilds. 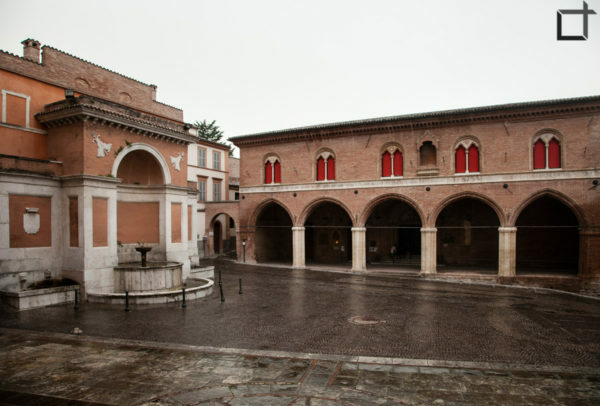 The imposing Palazzo del Podestà, built in 1255 in Romanesque-Gothic forms, testifies to the importance that the Municipality of Fabriano would soon assume, thanks above all to the strength of its economy. 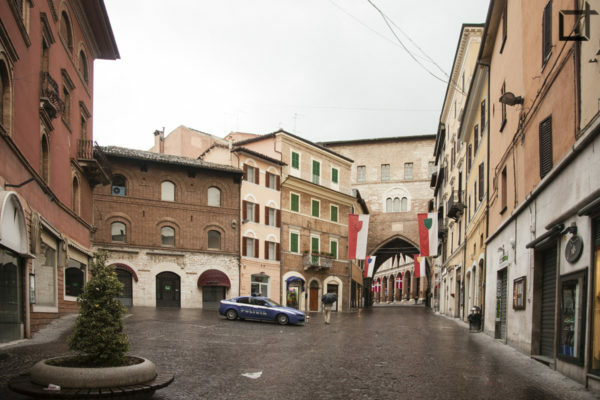 Also the fountain of 1285 called Sturinalto (because it “sends the water upwards”), which faces the building and recalls the Maggiore fountain of Perugia, is a significant testimony of the Fabriano municipal civilization. Among the guilds was the art of smiths that initially characterized Fabriano, so much to appear on the emblem of the city (image above left). The “factories” that stood in the area of the market square were 38 and produced artifacts for both domestic consumption and export. Between the twelfth and thirteenth centuries began for Fabriano a long period of prosperity characterized by the development of economic activities exercised by the various “arts”, among which were distinguished in 1278 those of Wool, Shoemakers, Leather Tanners (related to pastoralism and to the breeding), of the Guarnellari, of the Merciai and others. The Cartari corporation, which would have made the city famous far beyond the borders of the Italian peninsula, was born a little later, in 1326. The paper had come to Europe through the Arabs, but it had begun to be used very slowly. The Fabrianesi, the first in Italy, improved its manufacturing technique by adapting the machine already used for the fulling of wool and turning it into the hydraulic stack with multiple knitting, a gimmick to prepare the fibrous pulp with which to make the paper. Another important innovation was the technique of sizing with animal gelatine. Soon, thanks also to local merchants, the city became known in Europe for the processing of watermarked paper. In the political events of the Commune the guilds, which often hindered the seigniorial power, had a great influence. However, Fabriano had his lordship, that of the Chiavelli family, which later became later than other centers (1378) and ceased as early as 1435 with a popular revolt that led to the killing of all the male members of the family. After that the democratic government was re-established, however limited by the recognition of the dominion of Francesco Sforza as marquis of the Marca, a dominion that would have ended in 1444. Slowly during the fifteenth century, and even more, in the sixteenth century, the first signs of the economic decline of Fabriano began to appear. The main reason is to be found in the fact that, stimulated by the invention of printing, the art of paper had spread to other regions. But there were also political reasons, first the dominion of Francesco Sforza, then the loss of autonomy of the city passed under the direct control of the Papal State, the serious internal tensions that followed cullimate in 1519 with the defenestration of two magistrates, finally in 1517 the hard sacking that the Spanish and Neapolitan troops of the viceroy of Naples Ugo di Moncada inflicted on the city. The crisis of Fabriano’s manufacture and paper trade continued throughout the sixteenth century and was only arrested by Pietro Miliani at the end of the eighteenth century. Fabriano is located in the Marche region and is one of the most extensive territories in Italy, located within the beautiful nature at the foot of the Apennines. Its naturalistic riches and historical artistic heritage make it one of the most interesting cities in the Marche region. This city has so much to offer that we have decided to give you one of its many “keys to read”. We will guide you in an artistic journey where churches, monuments and palaces are not the real protagonists but the artists and the works that you will be able to observe. 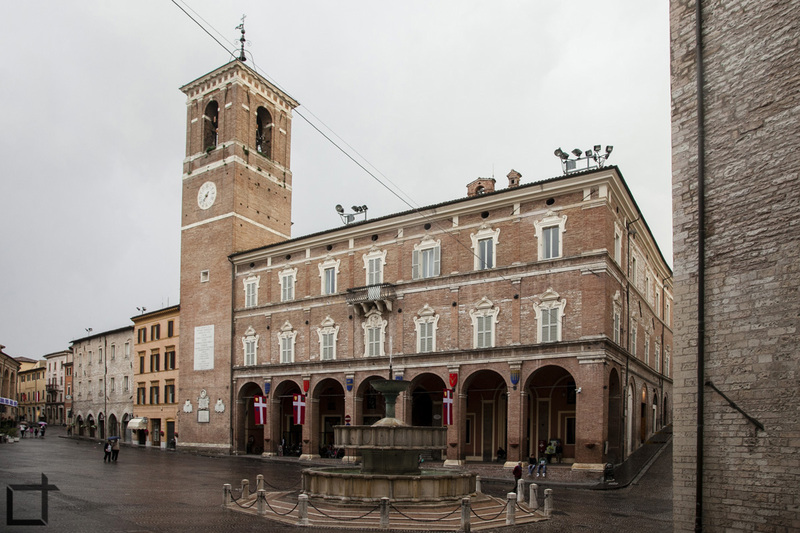 We will also show you the important Fabriano Museums which, on a first visit to the city, should never be left out. An incredible journey from gothic to mannerism. The last part of the Marca d’Ancona near Umbria, Fabriano, whose historic center is extraordinarily preserved, is surrounded by a green and naturalistically beautiful landscape. In the past, the small city of art was an important cultural crossroads. In the thirteenth century, also thanks to the economic prosperity spread through the paper trade, architectonic and pictorial works were developed that changed the face of Fabriano, giving rise to partly unpublished masterpieces. Civil buildings, churches, painting sites where the so-called “Fabriano school” is formed, make it an artistic center of primary importance. Fabriano still retains its medieval structure, gathered around the scenic Piazza del Comune, almost triangular in shape, overlooked by the most important city buildings. The gaze is captured by the Palazzo del Podestà, one of the highest examples of Gothic style in the Marches. The splendid building, all in white stone, has its own peculiar “bridge” typology due to the flooding of the river that flowed beneath it. Opposite, the Sturinalto fountain (1285), with an octagonal base; next to the Palazzo del Comune which has its roots in the XIV century already deductible from the vaulted vaulted ceiling. The Loggiato di S. Francesco instead, was built in the middle of the fifteenth century, to connect the imposing church of S. Francesco to the Piazza del Comune. It was prolonged at the end of the seventeenth century, with the addition of seven arches to the primitive twelve; and in 1790 it was connected to the adjoining Palazzo Comunale. The theory of the 19 high arches on the steep square, gives the same square a perspective effect of extraordinary suggestion. 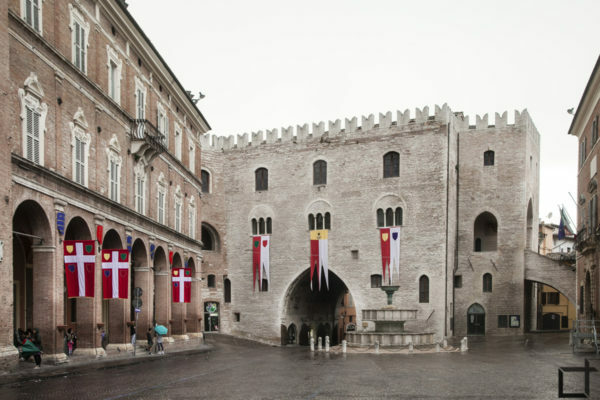 Behind the town hall is the eighteenth-century Teatro Gentile, one of the most beautiful and elegant in the Marche region. A walk in the center, along alleys and streets of the medieval urban network, offers glimpses of great charm and allows you to dwell in particular on some monumental complexes that host the museum excellences Fabriano, such as the famous Museum of Paper and Watermark or less known, but absolutely exciting for how it is conceived, Museo del Pianoforte storico. Born from a private collection of 18 pieces of priceless value, the small museum includes guided tours by a pianist, authentic concert visits in which it is possible to retrace, in the space of an hour, the evolution of the musical instrument from harpsichord to loud piano , finally piano and at the same time of music. Surprising to realize how some famous pieces by Bach, Mozart, Beethoven, have been devised on instruments with a sound very different from the current one. Listening to them performed in the original way, as these great masters had written them, is something literally unheard of. We highly recommend it. 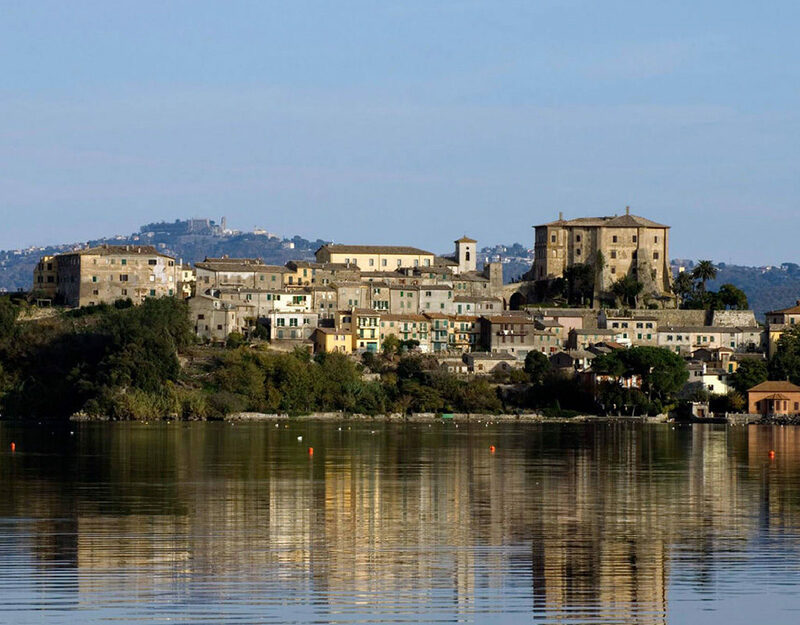 The name of the city is historically linked to the making of paper and the invention of the watermark: started between 1100 and 1200, the Fabriano industry developed mainly between the fifteenth and fifteenth centuries. The Museum of Paper and Filigree, which tells the story of the city’s production, is set up inside the San Domenico complex. During the visit you can see “live” all stages of processing and is especially recommended if you are in the company of teenagers and children. A twenty minute drive from Fabriano, climbing towards the mountains, is the small town of Genga. Here we would like to suggest a visit to the small medieval center of S. Vittore Terme, which rises around the abbey of S. Vittore delle Chiuse (Xl century), one of the most important monastic settlements in the region and an exceptional example of Romanesque architecture in the central Italy. In the premises of the former monastery there is a Paleontological Archeo-Speleological Museum. And of course we talk about caving during the visit to the Caves of Frasassi, one of the largest and most spectacular hypogeal complexes in Italy. 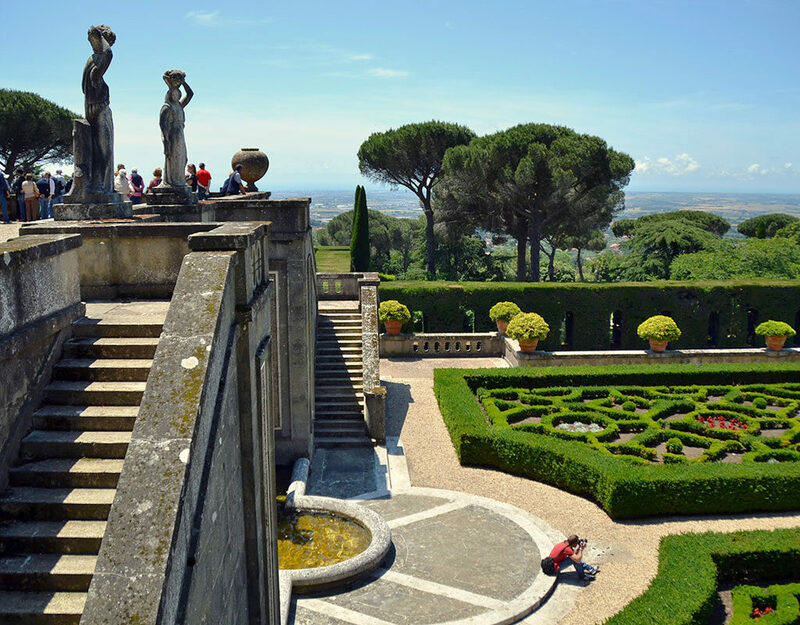 A walk of an hour and a quarter, accessible to all, leads to explore a series of fascinating caves: the great cavity called Abyss Ancona, the white stalactites called “Niagara Falls” and the millennial stalagmites of the “giants”. 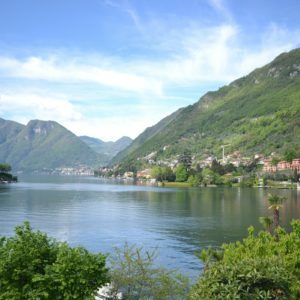 Lake Como is one of the most evocative and glamorous places in the world, a marvel that comes from the perfect fusion of nature and the hand of man. 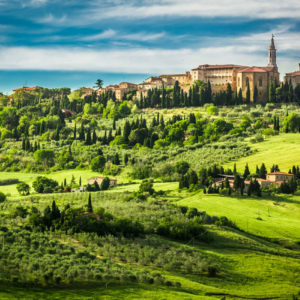 Pienza, located between the Valli dell’Orcia and dell’Asso, defined as a “little gem”,is a perfect example of Renaissance architecture and urban planning. A terrace overlooking the sea. 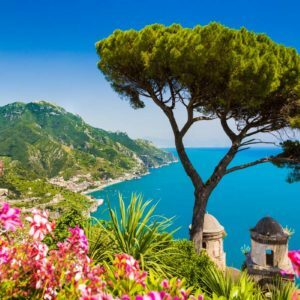 This is the image that comes to mind when thinking of the Amalfi Coast, that stretch of paradise….